“I grew up on a hefty diet of drawing”. My father was an artist so our house was full of art books, paints, pencils, pens, art pads, etc… As a result it became second nature to spend hours upon hours sketching anything I got my hands on, from Roger Rabbit to the impressionists. Over the years I fell in and out of art in one form or other until animation got a hold of me a few years ago. I initially studied Visual Communications, which was basically print-based graphic-design. Towards the end of the course I started tinkering around with animation via Flash. From here I was asked to pitch an idea for a music video for Dublin band Kopek. They loved it, I spent the next 6 months learning animation while creating the video and realized I actually quite enjoyed it. As a kid I was obsessed with Irish artist Jim Fitzpatrick, his unique art-nouveau/comic-book style was great to mimic and helped initiate my love of clean graphic work. Through him I got into the original art-nouveau artists such as Alphonse Mucha. Then as I progressed through college I gravitated towards futurism & cubism along with the early pioneers of moveable type, artists such as Filippo Tommaso Marinetti, László Moholy-Nagy, Theo van Doesburg, Piet Zwart and Jan Tschichold. I also had a obsession with the work of Josef Muller-Brockmann along with all mid century swiss graphic designers (me and every other design student). When it was socially acceptable to do so I tinkered around with Flash and have yet to wean myself off (but secretly don’t want to). This was the gateway drug to After Effects and later again the open source product Blender 3D. I’m not the best spokesperson for Blender 3D as my style only utilizes 1% of the programme’s capabilities. But it is a programme I’m pretty proud to be associated with given that it was spawned by the spare-time of random citizens of the internet. That’s pretty inspiring. For better or worse that film is determined to be my ambassador. Pretty weird for a film that was conceived and animated in six hours. Given the story so many people question its origins. When I give my honest answer of “It just popped into my head”, I get some pretty weird looks, and suddenly my long moonlight walks through the forest are questioned! Encounter started life as an digital sketch, one that I keep on the back burner for nearly six months or so. I eventually dusted it off and decided to add some movement, with no clear goal or direction in mind. The design and animation was so minimal it allowed most of the concept to be explored at the animation stage, the reverse of most animation projects. – Read more about Encounter. For the longest time I was scared of colour, it’s a very complex and often overlooked subject matter. I was more than happy to spend eternity paddling around in the shallows of monotone. Then one day I just dove into the deep end. Let’s just hope somebody stops me before I get too far from shore!. As with a lot of people going through grief I had an urge to create a monument or testament of sorts. Initially I envisioned the most complex piece of animation ever created whose intricate labor-intensive qualities would demand an audience. But not only was this a ridiculous quest, it was a concept doomed to failure as it was all filler and no soul. So I opted for a subtle personal message ahead of the Egyptian Pyramid. The moment the film came on screen for its premiere at the Galway Film Festival I was overcome with two vicious thoughts. One, the film was incredibly self-obsessed and two, I was using my family’s loss for personal gain. So strong were these thoughts that I pulled the film off the festival circuit and didn’t show it to anyone thereafter, including close friends and family. But one year later I finally caved to the urges of my family and friends and put the film online. The hesitations are still present but strangely enough are partially quenched by the flood of feedback I’ve been getting. “Giving the film an audience has been greatly rewarding”. 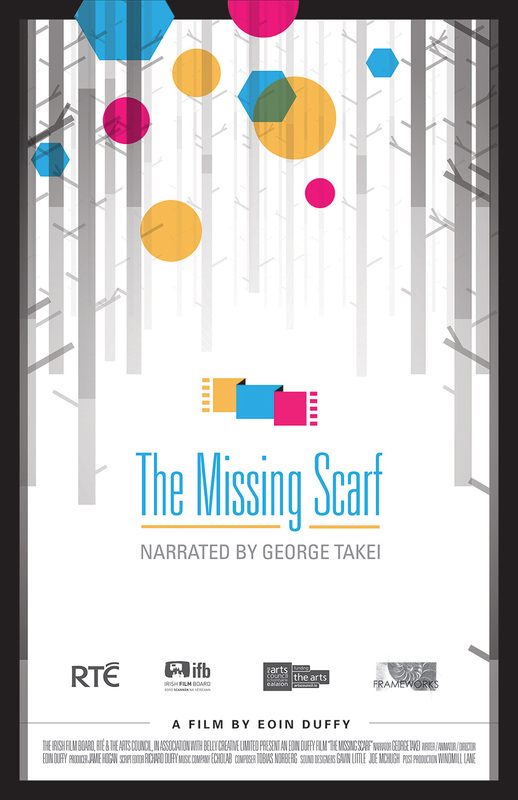 SYNOPSIS: Albert the Squirrel makes a startling discovery … an empty space where once his favourite scarf lay. He heads off into the forest only to find everyone else is preoccupied with worries of their own. He helps who he can before moving on but never seems to get any closer to his goal. Ultimately, Albert’s problem is put in perspective by the friends he helped and the problems they faced and overcame together. It’s about a squirrel searching for his missing scarf, kind of, but not really … you’ll have to wait and see. Let’s just say it contains some forest animals, a scarf and hints of nihilism. CONCEPT: The lighthearted lesson from the synopsis mirrors the initial misleading tone of the film. The audience is lulled into a false sense of security only to be covertly dealt four heavy subject matters. Presented in order they are – fear of the unknown, fear of failure, fear of rejection and finally the fear of death. For each fear both sides of an argument are presented, but visually no resolution is derived upon, allowing the audience to form their own conclusion. We were beyond excited to have George Takei onboard. The guy is one of the most positive humans in existence. He was a gentleman to work with and gave us an earth shattering voice-track, the guy still has it! So much so it inspired everyone else on the team to push the quality of their work to match, myself included. On Departure was my first short film, but as said it was denied a life on the festival scene. But hopefully it will have a second life through distribution as Future Shorts have added it to their catalog; along with its new found life on the web of course. In contrast, The Missing Scarf has a pretty complex festival strategy mapped out and we’re hoping for good things over the six months to a year period. After which we’ll seek a distributor and simultaneously release the film online. FESTIVAL RELEASE vs ONLINE RELEASE: This is a weekly debate for me. I’m torn between the two in regards to The Missing Scarf as a lot of festivals don’t accept films if they’re online. But I think in the end festival recognition holds more weight than online recognition. So as we progress through the festival scene we’ll contemplate when is a good time to pull the shoot and throw the film online. Having said all this SOTW’s article on Festivals and Online Eligibility has thrown a spanner in the works. Vimeo is such a great platform. I genuinely enjoy exploring its dark corners for hidden gems and as a launching platform, nothing compares. Also, all my client work originated through Vimeo so the site is invaluable to me. “I feel I’m at a crossroad right now”. I’m getting a ton of requests to create client work, but I’ve also got an endless list of personal projects I’d love to peruse or perhaps get funding for. So who knows? But I’m sure I’ll let twitter know. “Animate! Seriously spend every waking hour drawing, creating, animating, jotting down ideas, analyzing, building up your 10,000 hours, etc… I only wish I followed my own advice”. No problem Robert – glad you enjoyed the article – we’re huge fans of Eoin’s work so happy to share it with the online world.